You can create a VeeamZIP file for one or more vCD VMs. When Veeam Backup & Replication creates a VeeamZIP file for a vCD VM, it backs up a VM as separate object. 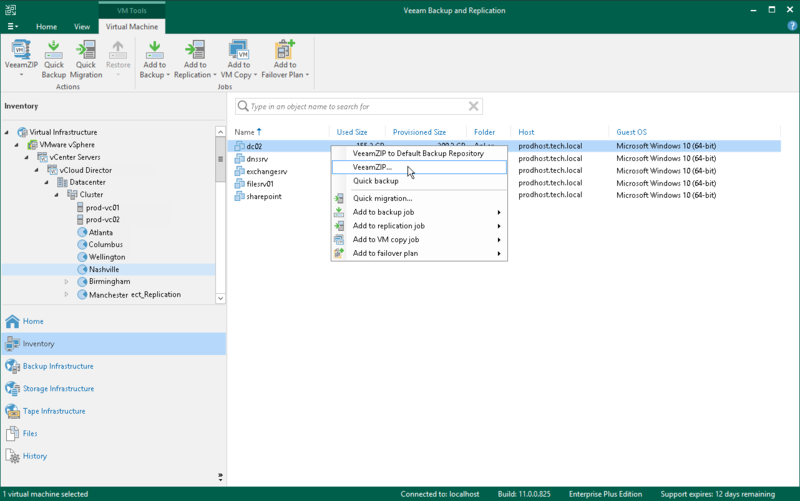 Veeam Backup & Replication does not capture metadata of the vApp to which the VM belongs. When you restore a vCD VM from the VeeamZIP file, Veeam Backup & Replication registers the VM on the underlying ESX(i) host and does not register the VM in vCloud Director. The process of VeeamZIP files creation for vCD VMs does not differ from that for regular VMware VMs. For more information, see Creating VeeamZIP Files.